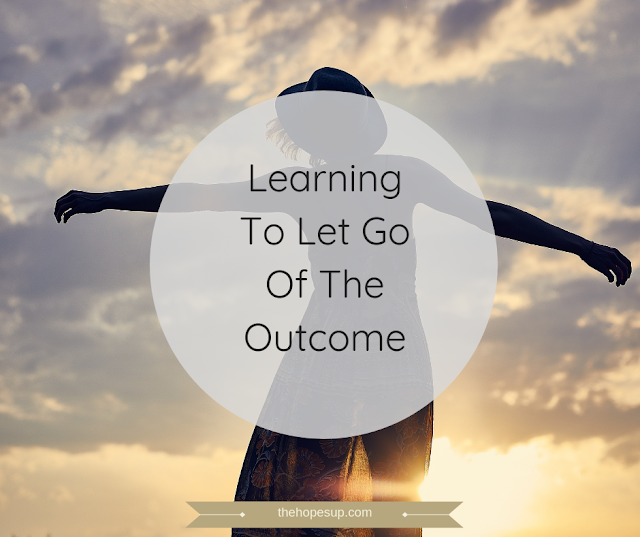 Desiring to obtain a favorable outcome is essential but so is letting go and taking a break. Sometimes it's best to live in the moment and not worry about anything else. Desperately waiting for everything to pan out exactly the way you want is going to drive you crazy. Being stressed or overworked is not going to make it happen sooner. It is important to let go. Let go worrying about the future. Let go worrying about the outcome. The experience you get from truly enjoying the process is far more fulfilling than the actual outcome itself. You would be proud of yourself for having persevered through all of the setbacks and unpleasant situations. You're more likely to be satisfied with the outcome if you love the process and appreciate the dedication you put into it. When you are focused on doing your best in the present moment, you feel content with yourself that will motivate you further to keep working towards your goal. On the other hand, if you put all your emphasis on only the outcome, the process would seem like a boring chore. Don't worry about the future, and don't doubt yourself by thinking whether you would actually be able to achieve your goals. Don't rush to be done with the process. Take care of the process, and the outcome will take care of itself. 2. Stop feeling too overwhelmed with the obstacles. Sure, you would want to achieve all your goals as soon as possible. But sometimes despite our sincere efforts, we don't see the results in the expected timeframe. You may have to deal with numerous obstacles and unexpected situations in your journey that leave you feeling restless and demotivated. When you are so preoccupied with achieving the desired outcomes as soon as possible, it's hard to think rationally in the midst of unfavorable circumstances. In such situations, you start doubting yourself and your abilities. You think maybe you won't be able to achieve your goals. Be clear about your goals, work on them with dedication and then just let go. Do not waste your time worrying about things that are out of your control. You need to believe in your strengths. You need to believe that you have the ability to go through this journey and successfully achieve your end goals despite any challenges you face in the way. Focus on making each day as productive as possible, and in no time, you will start seeing positive changes in yourself and get closer to your goals. You become a better version of yourself by working on your goals every day. Time goes by really fast, it might not seem that way when you are worried about the results. But when you work on making each day as productive as possible, you will get your desired outcomes before you know it. Sometimes letting of a particular outcome opens you up to several opportunities that prove to be even better than what you had in mind. However, when you waste your time in being apprehensive of the future, you lose sight of the valuable opportunities in the present that would bring your closer to your goals. When you let go of the outcome, you learn to appreciate your life as it is now. This allows you to keep a positive mindset while you work on bettering yourself and achieving your goals. Letting go is a liberating feeling. By letting go of the outcome, you no longer fight your thoughts. You make peace with the struggle of the journey. You no longer postpone your happiness. What are your thoughts on letting go? How do you approach your goals? Share your views with me in the comments below. This is such an important and timely post for me!! I’m getting ready to start an internship, and I am hoping for a job or career change, but I can’t rush any of this, as you pointed out, I need to make the most of each day, and enjoy the journey. I love “When you let go of the outcome, you learn to appreciate your life as it is now.” For me personally, if I make time each day, even just for a few minutes, to have some quiet time of reflection, prayer, perhaps a devotional, this helps me to appreciate the moments throughout the day, and not jump too far ahead. It’s important for me to quiet my mind, and be still, in this busy world. I look forward to reading your posts in 2019, Jigeesha, Happy New Year!! I'm so glad you liked this post, Rebecca! Reading your lovely comments make me happier. :D And, I totally agree with you on taking the time to reflect on your day. It definitely helps me to feel calmer and more centered. I think it's a good practice to follow. Good luck with your internship and Happy New Year to you too! Let's keep working on becoming the best version of ourselves.